Well, you see I am as good as my word, Bertie; and here is a full account of this queer little sample gouged out of real life, never to be seen, I should fancy, by any eye save your own. I have written to Horton also, and of course to my mother; but I don’t go into detail with them, as I have got into the way of doing with you. You keep on assuring me that you like it; so on your own head be it if you find my experiences gradually developing into a weariness. When I woke in the morning, and looked round at the bare walls and the basin on the packing case, I hardly knew where I was. Cullingworth came charging into the room in his dressing gown, however, and roused me effectually by putting his hands on the rail at the end of the bed, and throwing a somersault over it which brought his heels on to my pillow with a thud. He was in great spirits, and, squatting on the bed, he held forth about his plans while I dressed. “My dear chap!” I gasped. “Could you write a novel yourself?” I asked. “Of course I could. 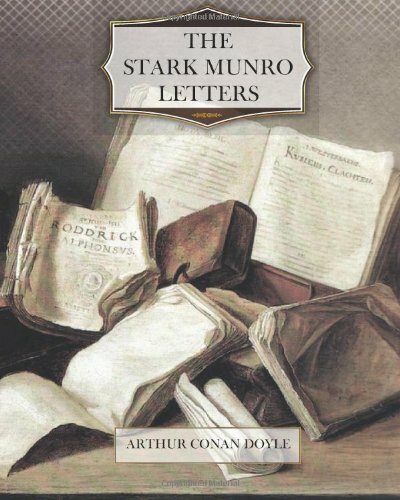 Such a novel, Munro, that when they’d read the first chapter the folk would just sit groaning until the second came out. They’d wait in rows outside my door in the hope of hearing what was coming next. By Crums, I’ll go and begin it now!” And, with another somersault over the end of the bed, he rushed from the room, with the tassels of his dressing gown flying behind him. I daresay you’ve quite come to the conclusion by this time that Cullingworth is simply an interesting pathological study—a man in the first stage of lunacy or general paralysis. You might not be so sure about it if you were in close contact with him. He justifies his wildest flights by what he does. It sounds grotesque when put down in black and white; but then it would have sounded equally grotesque a year ago if he had said that he would build up a huge practice in a twelvemonth. Now we see that he has done it. His possibilities are immense. He has such huge energy at the back of his fertility of invention. I am afraid, on thinking over all that I have written to you, that I may have given you a false impression of the man by dwelling too much on those incidents in which he has shown the strange and violent side of his character, and omitting the stretches between where his wisdom and judgment have had a chance. His conversation when he does not fly off at a tangent is full of pith and idea. “The greatest monument ever erected to Napoleon Buonaparte was the British National debt,” said he yesterday. Again, “We must never forget that the principal export of Great Britain to the United States IS the United States.” Again, speaking of Christianity, “What is intellectually unsound cannot be morally sound.” He shoots off a whole column of aphorisms in a single evening. I should like to have a man with a note book always beside him to gather up his waste. No; you must not let me give you a false impression of the man’s capacity. On the other hand, it would be dishonest to deny that I think him thoroughly unscrupulous, and full of very sinister traits. I am much mistaken, however, if he has not fine strata in his nature. He is capable of rising to heights as well as of sinking to depths. Well, when we had breakfasted we got into the carriage and drove off to the place of business. In fact, it HAD struck me as rather strange that she should, as a matter of course, accompany us to business. It was not very far, and we soon found ourselves outside a square whitewashed building, which had a huge “Dr. Cullingworth” on a great brass plate at the side of the door. Underneath was printed “May be consulted gratis from ten to four.” The door was open, and I caught a glimpse of a crowd of people waiting in the hall. “How many here?” asked Cullingworth of the page boy. “I tried, sir, but there’s a screw through the sash,” cried one fellow. “Ah, my boy, you’ll never get on in the world if you can’t open a window without raising a sash,” said Cullingworth, slapping him on the shoulder. He took the man’s umbrella and stuck it through two of the panes of glass. We went up a wooden stair, uncarpeted, leaving every room beneath us, as far as I could see, crowded with patients. At the top was a bare passage, which had two rooms opposite to each other at one end, and a single one at the other. “I should very much like to,” said I. “But don’t they get offended?” I asked. We walked down the passage to the other room. It was elaborately fitted up as a dispensary, and there with a chic little apron Mrs. Cullingworth was busy making up pills. With her sleeves turned up and a litter of glasses and bottles all round her, she was laughing away like a little child among its toys. It is impossible for me to give you any idea of that long line of patients, filing hour after hour through the unfurnished room, and departing, some amused, and some frightened, with their labels in their hands. Cullingworth’s antics are beyond belief. I laughed until I thought the wooden chair under me would have come to pieces. He roared, he raved, he swore, he pushed them about, slapped them on the back, shoved them against the wall, and occasionally rushed out to the head of the stair to address them en masse. At the same time, behind all this tomfoolery, I, watching his prescriptions, could see a quickness of diagnosis, a scientific insight, and a daring and unconventional use of drugs, which satisfied me that he was right in saying that, under all this charlatanism, there lay solid reasons for his success. Indeed, “charlatanism” is a misapplied word in this connection; for it would describe the doctor who puts on an artificial and conventional manner with his patients, rather than one who is absolutely frank and true to his own extraordinary nature. To some of his patients he neither said one word nor did he allow them to say one. With a loud “hush” he would rush at them, thump them on the chests, listen to their hearts, write their labels, and then run them out of the room by their shoulders. One poor old lady he greeted with a perfect scream. “You’ve been drinking too much tea!” he cried. “You are suffering from tea poisoning!” Then, without allowing her to get a word in, he clutched her by her crackling black mantle, dragged her up to the table, and held out a copy of “Taylor’s Medical Jurisprudence” which was lying there. “Put your hand on the book,” he thundered, “and swear that for fourteen days you will drink nothing but cocoa.” She swore with upturned eyes, and was instantly whirled off with her label in her hand, to the dispensary. I could imagine that to the last day of her life, the old lady would talk of her interview with Cullingworth; and I could well understand how the village from which she came would send fresh recruits to block up his waiting rooms. As far as I could judge, the bulk of the patients looked upon a morning at Cullingworth’s as a most enthralling public entertainment, tempered only by a thrill lest it should be their turn next to be made an exhibition of.